AI is already here and helping us with web searches, e-commerce and video recommendations. But the broader potential and greater purpose of AI is to help make the world a better place, which is why we made it the topic of a conversation on stage at the 2018 Samsung CEO Summit. I’m thrilled by what I heard from the innovators and entrepreneurs in attendance. 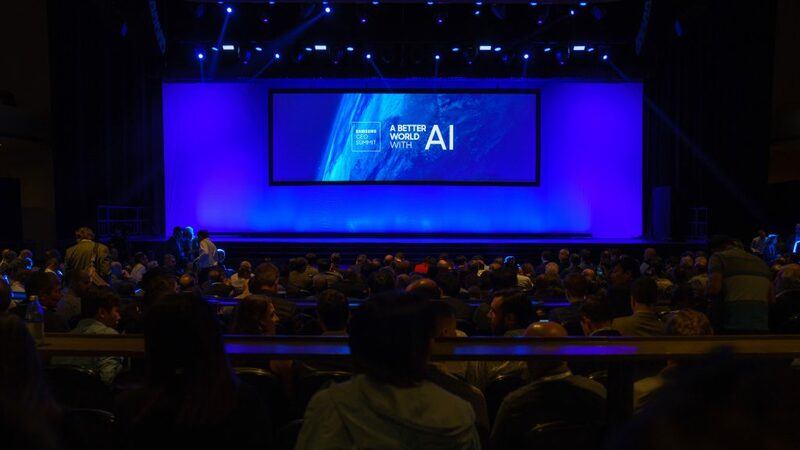 Hundreds of leaders came together to discuss the benefits and potential applications of artificial intelligence, as well as the motivation for pursuing them. We engaged in conversations about how our industry can be responsible stewards of AI’s world-shaping potential. I spoke with many people who have seen that, time and time again, our industry has pushed the limits of technology at breakneck speed. This time can be different. Since the 1960s, we’ve seen six waves of innovation that have changed the way the global economy works: semiconductors, personal computing, networking, internet, mobile, and social media. Right now, the seventh wave is rolling in: AI. It promises to be more powerful than anything that came before it. It’s a moment of excitement, but it’s also an occasion for caution. I say this not because we should fear AI the way movies would have us fear artificial general intelligence—that is, AI that can handle any creative task the way a human can. As Andrew Ng, a pioneer in deep learning, discussed on stage, all the recent breakthroughs have been the gains in artificial narrow intelligence—AI software designed to reason through a specific task—is where the next wave of tools will be born and not in artificial general intelligence. Like any tool, AI helps us do things we simply couldn’t do without it. But AI is not just any tool. Consider the breadth of its potential applications and ability to change the way we do business in every economic sector. Today, more than 90 percent of companies say they have AI projects and programs in development. This confers a special responsibility on AI innovators, entrepreneurs and investors to ensure AI benefits society as much as it benefits the economy. A responsible approach is required. So, what does that approach look like? It is not enough to get to market. The goal must be getting to market in a stable, secure, safe and inclusive way. It must include acknowledging unintended consequences and working to overcome the biases that, in the past, have prevented all communities of people from experiencing the benefits of a new technology. These must be ongoing efforts. We must pause to evaluate whether we are looking at the right problems. Are we creating meaningful solutions? Are we pursuing goals that are as vigilantly principled as they are economically ambitious? There are so many different ways to do just that. AI will change the way business gets done in every major enterprise in every industry and help to make the world a better place. The speakers at the Samsung CEO Summit offered interesting case studies in health care, cybersecurity and agricultural manufacturing. Daphne Koller, a pioneer in the area of machine learning and founder and CEO of Insitro, made the case that AI can revolutionize drug development. It’s an industry that is currently experiencing an acute crisis. As Daphne explained, the low-hanging fruit has already been plucked. Discover the next world-changing treatments requires increasingly more resources and more time. Today, pharmaceutical companies start with as many as 10,000 different molecules. It’s a massive expense. With luck and skill, they find the one molecule suitable for regulatory approvals, clinical trials, and, finally, the patient population. AI offers an entirely different approach to drug development. There is a growing body of genetic data available for analysis, to understand how genes influence the onset of disease. And that’s just the beginning. Daphne envisions using machine learning to bridge genotype to phenotype. AI can incorporate data from a range of other datasets, such as the lifestyle and environmental factors affecting the health of an individual patient, and help find molecules that are much more suitable to being a successful drug. Then there is the spread of digital diseases. Cyberattacks cause hundreds of millions of dollars in damage. A single hack can impact millions of consumers. Another Samsung CEO Summit speaker, Eli David, the cofounder of Deep Instinct and lecturer at Bar-Ilan University, noted that the capabilities of malware are beginning to outpace currently available countermeasures. AI can help us succeed where current frameworks fall short. Imagine a solution that takes raw binary as input and processes any file, even a very large file, to detect, classify, and prevent a threat. Imagine we could fit this system on a mobile device and run it without an internet connection. It’s a way to stop even a zero-day attack. This is an ambitious goal. It’s also a necessary effort. It won’t be long before black hat hackers will use deep learning to create malware. AI can help us preempt this threat and prevent the risks it poses. There are so many ways in which AI can create immense value. Andrew Ng envisions a future where AI embeds itself in even further into the agricultural industry to help end world hunger, where it redefines manufacturing so laborers are exposed to less risk, and where humans spend more of their time on work that makes the most of our unique capacity for creativity and higher order thinking. I’m confident these can be, and will be, the results of a more thoughtful approach to AI. And that confidence was echoed by our President and Chief Strategy Officer, Young Sohn, who shares that conviction, but tempered it with a call for responsibility.